There’s no doubt the word apartheid holds a certain a sting to it. Regardless, there are bits and pieces of existence in our world that require strong laws of separation, say: apple juice and chocolate milk, wine and liquor, George Clooney and Batman. Many believe religion and politics are best kept apart. In fact, most would swear by that belief. I don’t hold strong opinions on that matter per say, though religion and sports, well, that is a separation I’m fond of. YES, sports. More so, the NFL. No, no, not Tebow. But more so Ray Lewis. The 2012-2013 NFL season was a haven for Ray Lewis retirement talk; there’s no doubt that the Baltimore Ravens linebacker, who played seventeen seasons and finished with two championship rings, is one of the greatest. So yes, the NFL gave him a microphone throughout the season every chance they got. And what happened? Ray gave the glory all to God, just about every time he spoke. Now that is pretty cool, I have to admit. It takes bravery, from any religion or faith, for a person to speak their heart in front of anyone. And in front of the entire world? Well that takes balls… footballs. This comment stirred up a few things in me. To help process the good and the bad, I thought I’d make a good ol’ fashioned blog breakdown. 1. 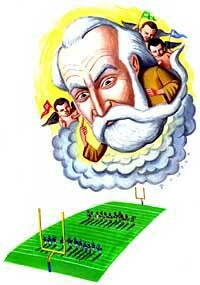 Does God Rig Football Games? This might sound ridiculous, though Ray Lewis is suggesting otherwise. The God of the universe, of Abraham, Isaac, and Joseph, breaks bookie bets? Is he a Baltimore fan or just more of an AFC guy? What does that say about the 49ers? 2. Like the ancient greeks, are we creating our own gods? You could argue that Raw Lewis is not praying to Yahweh, but rather Mahweh: the God of Football Favor. I don’t say this to tear down the guy, like I said, I really do respect him. But we need to get serious about who we claim God is, and His mission. We take our eyes off the prize—of furthering the Kingdom through serving and loving others—and place them onto a football field. Personally, I may or may not have prayed to Fantweh: the God of Fantasy Football once or twice. 3. If someone earns a pedestal, can they say whatever they want? Yes. Definitely. There is a double standard here; I feel that if I were in Ray’s shoes, I would be doing the same thing, but instead protecting the rainforest or freeing enslaved children that harvest cacao for Hershey’s. My point is that when you earn your spot, your soapbox, you’ve earned the right to speak your mind even if you have no idea what you’re talking about. It’s up to the receiver to filter words and decide on the speaker’s expertise. 4. Maybe Ray is right. Does God love Ray Lewis more than any of the other player on any other team? I don’t know. It’s a possibility I guess. I don’t want to assume I know the details of God’s design. Though, if God was rooting for the Mr. Lewis, you would assume he’d be retiring with seventeen championship rings instead of two. Maybe there is something larger at work than I know of. I could just be jealous that the Ravens cut me in the practice squad. (That never happened). What I do know, is that it’s easy to quote scripture but harder to eat it. We need to be careful about who we claim God is and let God claim us. See, there are plenty of gods going around these days and if we’re not careful, we may latch on to something less than eternal, less than love. Your post has just inspired me to write about a prayer my high school basketball coach offered up before we lost a big sectional game. Check out my blog tomorrow to find out what it was. P.S. May God bless you offering your space to this free promotional advertisement. This question also pertains to wars and countries that believe that “God” is on their side. Does God choose sides during a war – for that matter – would God really choose war as an option for resolving disputes? Mary, thanks for the comment. You really do bring up something larger than sports: does God pick sides at all? The only mention of dispute resolve, off the top of my head I can think of in the Hebrew/Christian bible, is when God says that men should resolve disputes among themselves first and then come to God.